Galician Talmudist; born 1770 at Nadworna; died 1840 at Buczacz. Even as a boy he attracted, by his acuteness in Talmudic knowledge, the attention of the leading Talmudists to such a degree that Ẓebi Hirsch, the author of "Neṭa' Sha'shu'im," chose him in his tenth year as a son-in-law. At the age of twenty he was ready to accept the office of rabbi at Goslowitz. The chief event of his life was the struggle awakened in him by the opposition between the Talmud and the Cabala. Unacquainted with the tendencies and modes of life of the Ḥasidim, Buczacz did not believe in the miracles of their rabbis; and his wife and friends had great difficulty in persuading him to take his sick son to a Ḥasidic rabbi, Levi Isaac of Berdychev. The latter, however, influenced him to take up the study of the Cabala; but in trying to reconcile these new views—so utterly antagonistic to those of the extreme Talmudists, which he himself had hitherto held—he nearly became insane. The Ḥasidic rabbi Levi Isaac of Berdychev helped him through this struggle and won him over, to the great joy of the Ḥasidim, who feared his wide Talmudic learning. Buczacz adopted the Ḥasidic mode of living; but in his decision of halakic questions was guided, not by cabalistic, but by purely Talmudic, principles. In 1813 he succeeded his late father-in-law as rabbi of Buczacz, and remained in office until his death. Buczacz is the author of the following works: (1) "Da'at Ḳedoshim," to the Shulḥan 'Aruk, Yoreh De'ah, Lemberg, 1870; 2d ed., ib. 1879; (2) "Dibre Abot," commentary on Abot, ib. 1879; (3) "Eshel Abraham," annotations to the Shulḥan 'Aruk, Oraḥ Ḥayyim, ib. 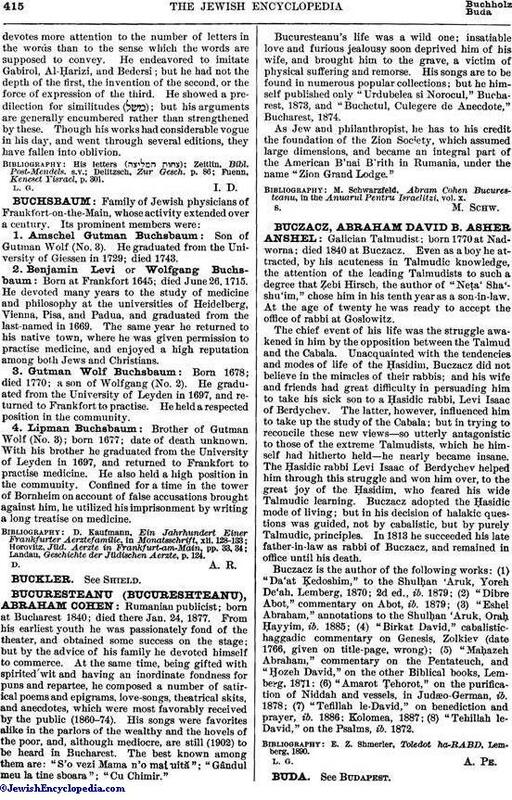 1885; (4) "Birkat David," cabalistichaggadic commentary on Genesis, Zolkiev (date 1766, given on title-page, wrong); (5) "Maḥazeh Abraham," commentary on the Pentateuch, and "Ḥozeh, David," on the other Biblical books, Lemberg, 1871; (6) "Amarot Ṭehorot," on the purification of Niddah and vessels, in Judæo-German, ib. 1878; (7) "Tefillah le-David," on benediction and prayer, ib. 1886; Kolomea, 1887; (8) "Tehillah le-David," on the Psalms, ib. 1872. E. Z. Shmerler, Toledot ha-RABD, Lemberg, 1890.